Base class for values associated with a node. 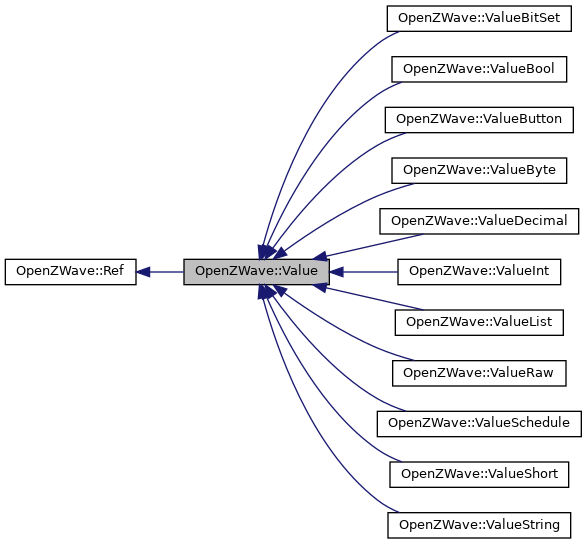 Reimplemented in OpenZWave::ValueList, OpenZWave::ValueSchedule, OpenZWave::ValueDecimal, OpenZWave::ValueBool, OpenZWave::ValueButton, OpenZWave::ValueByte, OpenZWave::ValueInt, OpenZWave::ValueRaw, OpenZWave::ValueShort, and OpenZWave::ValueString. Reimplemented in OpenZWave::ValueList, OpenZWave::ValueDecimal, OpenZWave::ValueBool, OpenZWave::ValueByte, OpenZWave::ValueInt, OpenZWave::ValueRaw, OpenZWave::ValueShort, and OpenZWave::ValueString.